Milky is a large cuddly white rabbit, the latest addition to the Emotion Pets family. Milky responds to being ticked on his tummy, feet or back. When his tummy rumbles, feed him his carrot and he'll respond by moving his mouth and chewing noisily. When Milky is excited, he blinks, wiggles his ears and his feet, but be careful, loud noises can scare him and then his ears will tremble. And when it's time to sleep, he gives a few little snores. He's the perfect size for little girls to cuddle and his soft fur and padding carefully hides the electronics from both sight and touch. Milky takes 4 x AA batteries and is suitable for ages 4 and above. Cute Bunny or Villain in Waiting? For anyone who has owned a large white rabbit in real life, you know the last thing they usually like is a full-on cuddle. Jane in our office had one as a kid, and still claims to still have the feet kick bruising and claw marks to prove it! 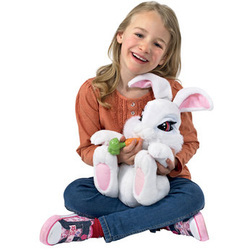 Real pet rabbits much prefer to be tummy down, thank you very much, so that's why Milky is so great for kids to cuddle. 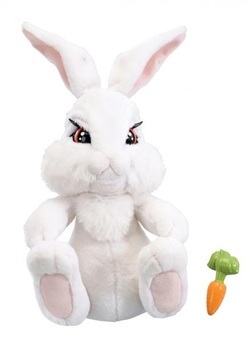 Mind you, it has to be said, the front view promo shots do make Milky the Bunny look a little manic! "Milky the Bunny - the kind of rabbit you know will eventually be the star of a horror movie where it comes to life and runs amok, killing entire families. The PR blurb says, 'Also with a random play function, you never know what he will do next!' See?"